The Tibetan Bowl Sound Healing School operated by Sound Energy Healing in association with Sacred Sound Workshops is an organization dedicated to the research, awareness of and training in the uses of the Tibetan Sacred Sound Instruments (singing bowls,gantas & tingshas) as therapeutic and transformational modalities. We have been in operation since 2008 as one of the first schools to offer training in this modality. In addition to practical layouts, energy medicine and specific usage of each instrument, ( ie tingsha diagnosis, tibetan bowl layouts, ganta/dorje usage) our training includes exposure to the Tibetan Buddhist philosophy which provides the foundation of the modality. Students learn some of the history and Tibetan Buddhist principles at play and so important in the usage of these sacred sound instruments. Based in Southern California, we offer a Certification Program that insures a high standard of excellence in this modality for potential practitioners. Our program is not a quick and easy one. We believe that to attain skill and mastery, a good deal of practice and a thorough understanding of the principals behind each protocol is essential. If you seek a quick certificate, this is not the place for you. We believe that only practice and a thorough integration of what is introduced in each workshop will produce skilled practitioners. 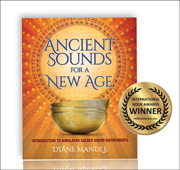 This website introduces you to the Certification Program (both On -site and Distance) and to a plethora of excellent resources on Tibetan bowl sound healing. The workshop was a mindful mix of lecture - demo - hands on. The class built concept on concept leading to the final hands-on where we each conducted a sound healing session on a class member under the watchful eye and loving guidance of Diáne. Diáne Mandle, is a very kind, mindful caring teacher who brings to the art, her heart, soul and years of experience. Her teaching style is well suited to those of us who learn best by doing, whether you are an experienced healer or just starting in the healing arts this class is an excellent foundation for your next step in energy work.' Thank you... Rick. 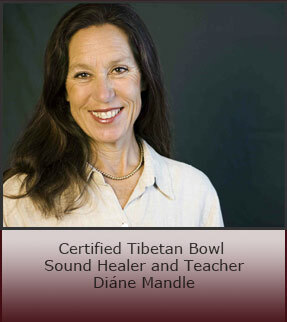 Copyright 2010 Tibetan Bowl Sound Healing School. All Rights Reserved.